The Election – A game changer for the markets? The US equity market completed a lackluster and weak October, unable to rise above post-Brexit highs reached early in the third quarter. The uncertainty of a close race caused market weakness and investor hesitation. Mrs. Clinton was expected to be elected president, with a high probability, and markets planned for more of the same. As the election neared, the conventional wisdom was that an unlikely Mr. Trump win would result in a 10-15% drop in the market. Electing a non-politician with a volatile temperament and unclear policies would be very concerning to investors. As Election Day unfolded, electoral votes were tallied and Mr. Trump’s chances of winning grew. Overnight futures markets indicated US equities would be down 800 Dow points or about 4%. Late into the evening, when enough electoral votes had been counted, Mr. Trump was declared the winner and Mrs. Clinton conceded the election. Mr. Trump then gave a very inclusive acceptance speech, reaching out to supporters and non-supporters alike and stressing national unity. The speech calmed investors and equities reversed course. The overnight selloff disappeared and by Wednesday’s opening bell, the equity market was moving higher. By the end of November, large and mid-cap stocks had finished the month about 4% higher and small cap stocks about 9% higher. Since then, US equities have set new record highs. Bonds fell dramatically as yields rose to levels not seen since mid-2015, when the Fed was expected to raise rates several times. All income producing investments were hurt, as it became a certainty that the Fed would raise interest rates in December. In anticipation of higher US rates and uncertain trade policy, the dollar rose strongly. Furthermore, potential US protectionist policies towards China, Mexico and other emerging markets, sent their equity markets, bonds and currencies tumbling. Non-US bonds followed US bonds lower, as they often do during major moves. Higher bond yields in Europe and Japan effectively tighten monetary conditions and work against their central banks’ loose monetary policies. As the new administration potentially over-stimulates a mature US economy, there are also investor concerns about inflation heating up. The Lackluster US recovery – How did we get here and can we do better? In 1973, the US economy experienced an oil shock that sent it into a recession. Oil, a major input of production in the pre-dominantly manufacturing-based economy, surged in price overnight. This raised the cost of doing business across the US economy immediately. With no change in revenue, a sizable increase in costs delivered a sizable hit to profits. The 2008 Great Recession was devastating to the US economy and financial markets. Workers, homeowners, investors and countless others suffered. Many jobs were lost, along with health care benefits that were paid by employers. The US banking system came uncomfortably close to collapsing. The Affordable Care Act (aka Obamacare) was signed into law in 2010 with the goal of reforming the health care industry to make health care more affordable to all Americans. The results of implementation, several years later, have not been satisfactory. Many insurers and health care providers have left the industry, some patients have received worse care, and costs have risen substantially for all companies and individuals. Well-intended rules and regulations often have unintended consequences. The impact of Obamacare could be viewed as an “oil shock” to today’s service-based economy. Obamacare raised the cost of non-wage compensation (health care) for all employees. This caused an immediate increase in the cost of a critical input to delivering service – labor. Such a labor cost increase reduces profits and jobs. For businesses that have no choice, they experience an increase in costs to maintain existing employees. If the businesses become too unprofitable, then they close – eliminating jobs. For those businesses that can use less labor and more technology, they invest in more technology so they can use less labor – eliminating jobs. There were many other well-intended actions/regulations imposed since 2008. While politically very popular to avoid a repeat of and punish “participants” in the Great Recession, these actions have arguably gone too far – weighing down the economy and contributing to the weakest post-war recovery on record. The Current Recovery – How does it compare? 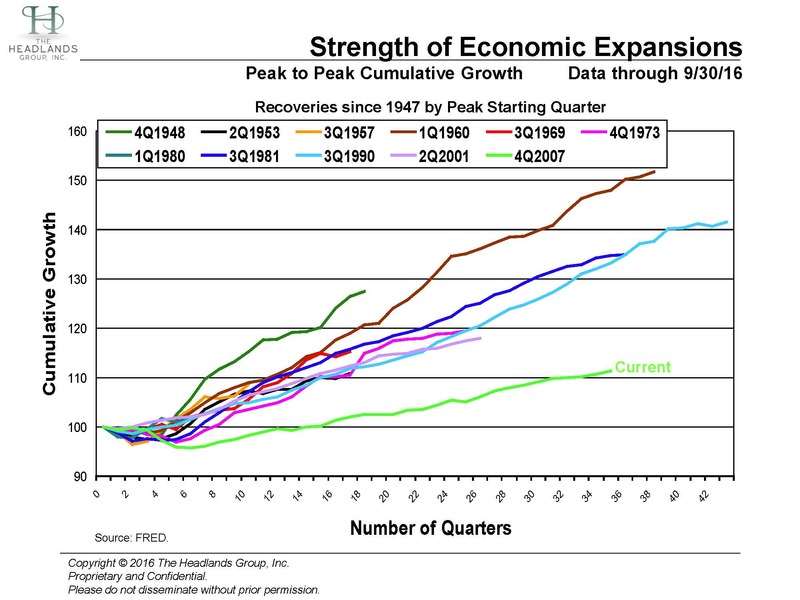 The lines on the above chart illustrate the strength and length of the current US economic expansion (since 4Q2007), compared with all others since 1947. While the length is impressive, the shortfall in cumulative real growth compared with the others is striking. Measured peak to peak, the length of past recoveries has been between 6 quarters and 43 quarters, with a median of 21 quarters. The current recovery, at 35 quarters so far, makes it one of the longest. Cumulative real growth in past recoveries has been between 2% and 52%, with a median of 19%. The current recovery has grown 11% so far, well below the median. Dividing median growth by median number of quarters gives an annual pace of 3.5%, compared with a 63% slower 1.3% in today’s recovery. Fed Chairwoman Janet Yellen has commented on the unusually weak productivity (output per worker) in this recovery and how little the economy has responded to the Fed’s massive monetary stimulus. 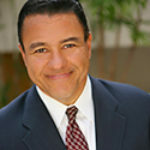 Good regulations, like good business attorneys, figure out ways for businesses to operate safely. Bad regulations, like bad business attorneys, just shut down business. How much business has been unintentionally shut down by bad regulations? The surprise election of Donald Trump has the potential to roll back bad, “shut down” regulations and replace them with smarter regulations that allow businesses to grow while operating “safely.” This can potentially expand the capacity of the US economy, extend the recovery without igniting inflation, and create new jobs by making hiring more attractive. Banking and Interest Rates – Can we fix them? The top chart above shows US short term interest rates as set by the Federal Reserve since 1959. Interest rates typically move up and down with the economic cycle, rising to slow growth (when the economy heats up) and dropping to stimulate growth (during a recession). Increases in bank capital requirements and other regulations such as Dodd-Frank following the Great Recession continue to discourage lending, making less capital available to would be borrowers. To offset this, the Fed has kept short term rates near zero to provide cheap capital for the economy. Furthermore, the Federal Reserve purchased and still holds Treasury bonds through its Quantitative Easing Programs (QE1, QE2 and QE3). This effectively keeps long term bond yields low, providing more stimulus. There have been many consequences to this policy. Since all market interest rates followed Treasury yields lower, it provided cheap financing to certain borrowers such as home mortgage refinancing candidates and corporations issuing debt in the public market. It also provided investors holding bonds with capital gains on their bonds as interest rates fell. However, lower costs of capital to issuers means lower expected returns to investors. New bond investors need to buy in at the high prices/low rates – reducing their expected future returns. Another effect of lower interest rates has been to push up the prices of all financial assets, especially equities. High prices of rising equities and bonds (low yields) have caused many observers to decry an era of lower future returns, a “New Normal” for investors. This also means lower interest and dividend payments for retirees and savers. 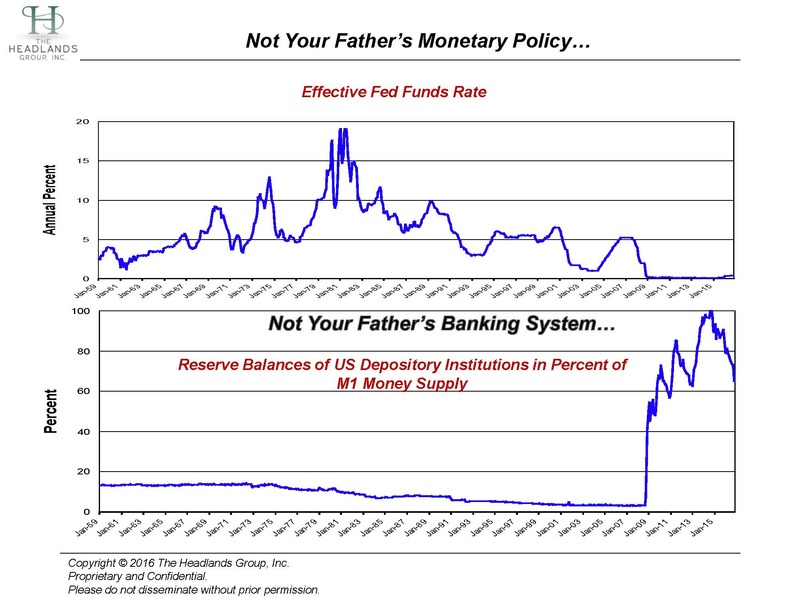 The bottom chart above shows the reserves in the US banking system, as a percentage of money in circulation. It illustrates the percentage of reserves set aside for money being loaned out. This figure has been below 20% since the 1950s. “Fractional Reserve Banking” allows financial institutions to set aside about 8-10% of deposits (reserve requirements) for loans that are made. Since 2008, however, new capital requirements and other regulations have discouraged lending so much that reserves set aside have at times approached 100% of loans outstanding – effectively eliminating fractional reserve banking. This is the reason that zero short-term rates and quantitative easing have provided limited expansion in the money supply, limited stimulus and limited inflation to the economy. The money the Fed has put into the banking system is not being loaned out. Yet, the Fed continues to be surprised at how little growth or inflation its highly simulative policies have created. One goal of the incoming administration is “getting banks to lend again” by rolling back portions of Dodd-Frank rules. If it is successful, we will see a Federal Reserve scrambling to return monetary policy/interest rates to more normal levels. The trick for the Fed will be balancing the timing. As growth and lending pick up, the Fed must respond with higher rates and reduced stimulus programs. Acting too soon risks recession, while waiting too long risks inflation. 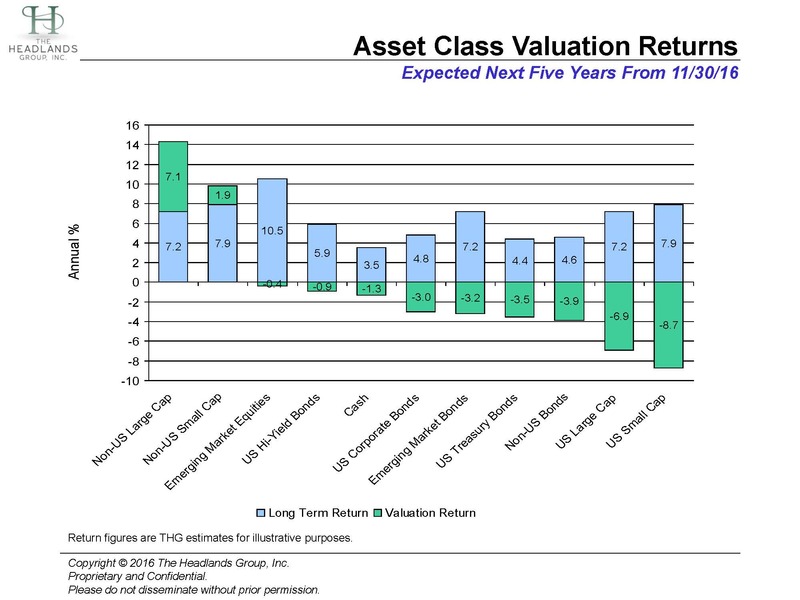 The Outlook for Markets and Valuation – What can investors expect? Potentially improving US growth, rising short term/long-term rates, first in the US and then outside the US, will set the tone for what happens to all financial markets. In bond markets, short term should outperform long-term. Credit spreads should come down as economic growth improves, helping corporate bonds over government bonds. This should be true for high yield too. Equities, like other investments, such as housing, will be helped more from the better growth outlook than hurt from rising rates. The tailwind all risky assets have enjoyed from easy money/low rates will start to dissipate. It will become a headwind. As markets enter a more typical second stage of a market/economic recovery cycle, GDP and earnings growth will support risky assets. We continue to monitor undervalued non-US equity markets for signs of new government “fiscal policy stimulus”, such as what we expect in the US, rather than simply more of the same monetary stimulus. Smarter regulation and more incentives for business formation should help revive growth outside the US. This will allow markets to reward patient investors who have been willing to buy their undervalued shares. As this happens, we expect non-US currencies to recover along with non-US equity markets.